Well, having just got through the wettest winter since we started trading we’re now faced with the driest summer! The weather is just incredibly unpredictable and the constant talk in our house! Of course, it has its challenges, with some plants being more difficult to manage than others! 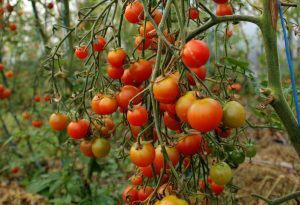 However, as ever looking on the bright side, the tomatoes in the tunnel are looking absolutely amazing and taste delicious. The cherry varieties are already coming with abundance, Super Sweet 100, Sun Gold and Tomatoberry are all deliciously tasty and really remind us that summer’s well and truly arrived! This year we’ve been successful in growing aubergines, probably due to the heat in the tunnel and our experimental apricot and peach trees provided lots of wonderful fruit, sadly now all finished. French Beans, which we always plant inside to have an early crop, grew well and have now been removed to make way for more which will finish the bean season when they are ready, in the meantime the outside French Beans are being harvested, as are the very popular but extremely labour intensive Fine Green Beans. Back in the tunnels the courgettes are producing well, although the outside planting are also doing well so likely the inside ones will soon be removed to make way for more loose leaf salad; whilst we normally grow this outside, due to the weather it’s completely impossible this year so it’s taking up tunnel space! Outside the squash are truly amazing, we’ve always said that growing them is challenging, they really need a much warmer climate than we have here, but this year they are obviously benefitting from the heat and we have some wonderful examples, just like the picture on the packet. The sweet corn has also benefitted from the sunshine, although it could probably do with a little drink now. However, the cobs are well formed and starting to change colour, it won’t be long before the harvest starts. Regrettably due to the weather, many of our other crops are struggling. Lack of moisture has impeded germination specifically of carrots and we still have a significant number of brassicas to plant out. Those which are in the fields are just about holding their own, and the potatoes have grown with virtually no rain at all. Challenging times ahead, but no doubt we’ll tackle them head on!